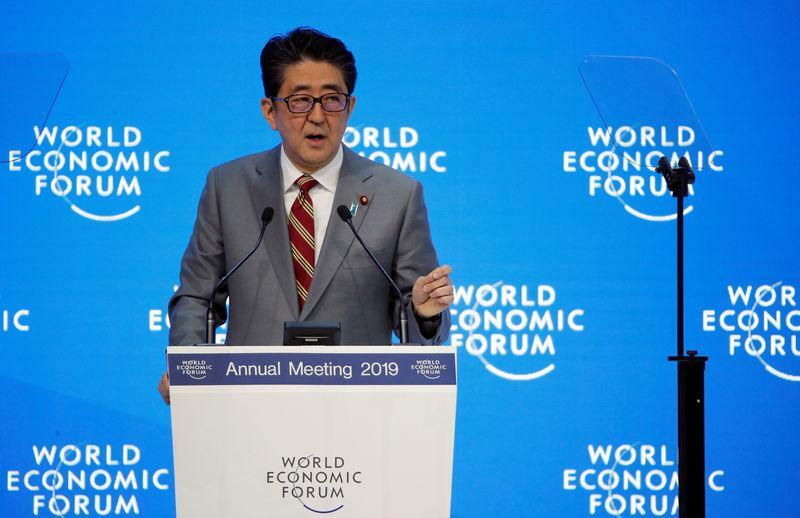 DAVOS, Switzerland (Reuters) - Japanese Prime Minister Shinzo Abe said on Wednesday he will seek to use his chairmanship of the Group of 20 leading economies to rebuild trust in the global trade system and foster consensus on ways to address climate change. His speech to the World Economic Forum in the Swiss Alps was significant at a time when a bitter Sino-U.S. trade dispute is one of several factors threatening to bring about a sharp slowdown in global growth. "Japan is determined to preserve and committed to enhancing the free, open, and rules-based international order," he told delegates. "I call on all of you ... to rebuild trust toward the system for international trade. That should be a system that is fair, transparent, and effective in protecting intellectual property rights and also in such areas as e-commerce and government procurement." Abe said Japan hoped to work with the United States and Europe to reform World Trade Organization (WTO) rules so they adopt to a rapidly changing environment for global trade. "We have to make the WTO a more credible presence. We have to make reforms to make it more credible. Japan would like to play a leading role in WTO reforms," he said. The WTO has been paralyzed as the United States, unhappy with what it says is the WTO's failure to hold Beijing to account for not opening up its economy, has blocked new appointments to the world's top trade court. Rapidly running out of judges, some analysts say the WTO will be unable to issue binding rulings in trade disputes. With the French, British and U.S. leaders cancelling their visits because of more pressing concerns at home, Abe is one of only three Group of Seven leaders attending the annual event in Davos, where business executives are worried about the damage that populism and trade protectionism are inflicting on the global economy. Abe said Japan, as chair of this year's gathering of the Group of 20 (G20), will also seek to spearhead discussions on climate change and ways to facilitate use of digital data while protecting intellectual property. The comments underscore Japan's hope to rally support from some of its G20 counterparts in pushing for a multilateral approach in solving trade frictions. That could help Tokyo fend off pressure from Washington to open up its politically sensitive agriculture market and take other steps to fix bilateral trade imbalances, analysts say. Japan has to be consistent on the need to promote free trade "and shouldn't change this stance even if the United States is always talking about doing a bilateral deal," said Takeshi Niinami, head of brewer Suntory Holdings Ltd and an economic adviser to Abe. Australia, Singapore and other Trans-Pacific Partnership (TPP) countries could help Japan make free trade a key topic of debate at the G20, he told Reuters. At his previous Davos visit in 2014, Abe pledged to pull the economy out of stagnation with his "Abenomics" mix of fiscal spending, ultra-easy monetary policy and steps to boost Japan's potential growth via labour market reform and deregulation. Five years later, the boost to growth from Abenomics is fading, inflation remains far below the Bank of Japan's target and critics point to a lack of progress on deregulation. Abe sought to counter such criticism, saying that Japan's economic fundamentals were "very solid and robust." He also reiterated his resolve to proceed with a scheduled rise in the rate of consumption tax in October. Aside from trade, Abe said Japan hoped to build a G20 consensus on the need to reduce plastic waste flowing into the oceans, and coordinate on global usage of digital data without infringing on personal privacy and intellectual property. "Decarbonisation and profit making can happen in tandem. We policy makers must be held responsible to make it happen, as I will be stressing in Osaka this year," he said. People close to the premier have said Abe is keen to use the G20 summit in Osaka, western Japan, in June to boost his poll ratings ahead of an upper house election looming mid-year.